Born/lived: New York, NY/ Kent, CT, Albemarle County, VA, Charlottesville, VA. He painted in the Deep South in Charleston and Savannah, Kent, CT along the Housatonic River, art colonies at Annisquam, Gloucester, Chadd’s Ford and Ogunquit, in Venice, Grand Canyon, in New Mexico, the Painted Desert and northern Arizona, in California, painting in Yosemite, Himalayas and also Tibet. He traveled in London, Belgium, Swiss, German, and Italian Alps, Venice, Ferrara, Bologna, Florence, Capri, and Naples, Spain, the Prado, Toledo. Known: as one of the few American Impressionists of the Southern States. 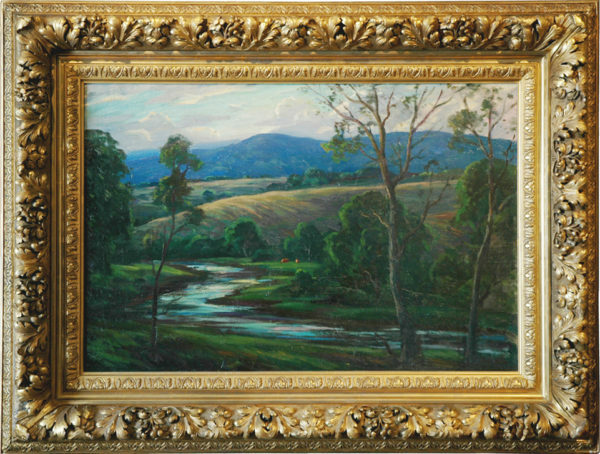 He began as a tonalist landscape painter, then became an American Impressionist. Studied: Arts Students League with J. Twachtman; W. Clark and in France in Paris and Giverny, and in London. Member: National Academy of Design, 1944 (pres. 1956-59); American Watercolor Society (pres. ), Allied Artists America (pres. 1945-1953); National Arts Club; National Sculpture Society (hon. member), Society of Painters of New York; Connecticut Association of Fine Art; Salmagundi Club; International Society of Arts and Letters; Macdonald Club; Art Fund Society; New York Watercolor Club. Exhibited: New York Watercolor Club; National Academy of Design; American Art Association of Paris Annual Exhibition; Doll & Richards, Boston; Louis Katz Gallery, NY; Guild of Allied Artists, NY; Milwaukee Art Institute; Henry Reinhardt & Son, NY; Mohr Art Galleries; Butler Art Institute; Telfair Academy, Georgia; Rochester Art Association, Rochester, MN; J.W. Young Galleries; Atlanta Woman’s Club; Fort Worth Museum of Art, Texas; Carnegie Public Library; Providence Art Club; Witt Memorial Museum, Texas; Nan Sheets Gallery, Oklahoma; Iran Institute. Work: Metropolitan Museum of Art; National Academy of Design; National Art Club; Baltimore Museum of Art; Dayton Museum of Art; Dayton Art Institute; Muncie Art Assoc; Witte Member Museum; Ft. Worth Art Assoc; Wichita Falls Women’s Club; San Antonio Women’s Club; San Antonio Art Museum. Publications: a book about Twachtman, Theodore Robinson, Childe Hassam, Julian Weir, and Robert Vonnoh and about the history of the National Academy of Design. As president of the National Academy of Design, he wrote about its history. Comments This painting is in excellent condition in a very fine period gold frame, also in excellent condition.